Cuomo says he will have to revise his proposed budget as personal income tax collections drop $2.8 billion. Gov. Andrew M. Cuomo delivers the 2019 State of the State and Budget address in Albany on Jan. 15. Photo Credit: Newsday / J. Conrad Williams Jr.
ALBANY — Gov. 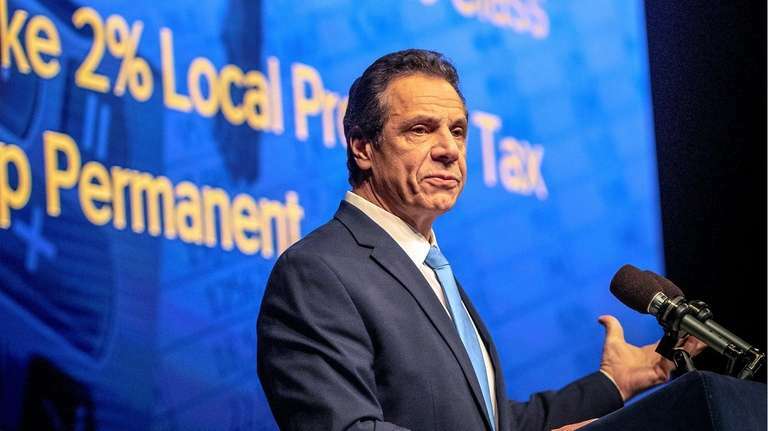 Andrew M. Cuomo on Monday announced a dramatic drop in state income tax revenue of $2.8 billion, which he says will prompt him to revise his 2019-20 budget and reconsider spending on schools, health care and repairs to roads and bridges. Cuomo, a Democrat, blamed the shortfall on a federal tax plan backed by Republican President Donald Trump. Cuomo said the law's cap on deductions for state and local taxes at $10,000 was to blame and suggested it is, anecdotally, triggering high-earners to leave New York. Cuomo said he’s not certain what areas might need to be cut, but said the biggest spending areas now are education, health care, infrastructure and another phase-in of a previously approved middle-class tax cut. The hole in revenues in December, which some analysts have called a December surprise, and continued poor performance in January have created a $2.3 billion drop in anticipated revenues, according to the Cuomo administration. Add that to the $500 million drop in revenues for December that the Cuomo administration had previously projected and the revenue hole is $2.8 billion, according to Cuomo Budget Director Robert Mujica. Those details had been previously outlined in a Jan. 24 report by Moody's Investor Services, which monitors state government finances. “I fear it’s going to get worse before it gets better,” state Comptroller Thomas DiNapoli said in a rare news conference with Cuomo. “It’s not all gloom and doom, but it’s a matter of very, very serious concern.” Tax revenues could rebound, he said, but he agreed with Cuomo that early indicators are not good. Cuomo has until mid-February to submit amendments to his budget, which came in at $175.2 billion when he unveiled it Jan. 15. The announcement also serves notice to the legislature, which for the first time in most of a half-century is controlled by Democrats. The Democratic majorities in the Senate and Assembly have several proposals to add to the budget. Cuomo will no longer have Senate Republicans as an ally for fiscally conservative measures. The Republicans lost the majority in the November elections. “Our analysts have seen the same troubling trends in revenue, but we need to look at more information before any drastic decisions are made,” said Senate Democratic spokesman Mike Murphy. Cuomo blames Trump and his 2017 tax cut legislation for prompting New York's wealthiest taxpayers to change their legal address to another state to avoid a big federal tax hit. He said he bases this on anecodatal stories, not hard facts yet, but that the behavior of just a few thousand of these high-earners could have a significant impact on state revenues. Trump's legislation provides tax cuts for most Americans, but caps the federal deductibility of state and local taxes at $10,000. 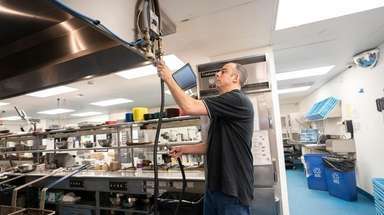 That means high-income, high-tax areas such as Long Island can no longer deduct their full state and local taxes on their federal income taxes, which can be a major added cost. Cuomo said the loss of federal deductibility greatly affects the 1 percent of taxpayers who pay almost half of New York’s taxes and he notes they are highly mobile, able to move their legal residence out of New York easily. Moody's noted that New York taxpayers were encouraged to pay their 2018 taxes early, by Dec. 31, 2017, before the new federal deduction cap became effective. That provided New York with an increase in tax revenue in December 2017 but also partially explains the drop in December 2018 when fewer people had to pay estimated taxes, Moody's said. It didn't provide a specific estimate of the 2018 revenue hit. “Lower December results often lead to reduced expectations for receipts in the current fiscal year and in future years,” Moody’s said in its Jan. 24 report. Some of the lost revenue may reflect early payments made by some New Yorkers in 2017 seeking to pay their estimated state income tax early to get the federal deduction before the federal tax law took effect in 2018. But the state had already accounted for that effect and lowered its projection for December 2018 revenues by $2.4 million. The revenue drop reported Monday was from that lowered projection, said Cuomo budget spokesman Morris Peters. Cuomo noted that states dominated by Democratic voters, like New York, New Jersey and California, are hit by the loss of deductibility but lower-wage, lower-taxed states in the Midwest and South — which voted for Trump — enjoy the tax break unscathed. “The change fundamentally restructures the economy,” Cuomo said of the federal tax legislation. Moody's said other factors include a volatile stock market that hurt tax revenues and some big federal aid cuts to health care and other areas. Cuomo said that he and his administration are blameless. He said the continued exodus of residents from the state and a temporary millionaire’s tax created in 2009 to contend with the Great Recession (but which he’s extended since then) are not contributing factors. “We did everything right from a tax point of view,” Cuomo said. In January, Cuomo proposed to cut aid to municipalities, keep spending level for most agencies and extend the temporary millionaire's tax from 2007, which is scheduled to end at sunset Dec. 31, for another five years. While Culomo said he has met his self-imposed cap of 2 percent spending growth, not everyone agrees. State operating funds spending will grow by 3.4 percent — the third year in a row that Cuomo exceeded his 2 percent cap, said David Friedfel, director of state studies at the independent Citizens Budget Commission. “The state's rainy-day funds grew slightly to $2.3 billion, but fall far short of what would be necessary to contend with an economic slowdown or recession,” said CBC president Andrew Rein. He said Cuomo uses “gimmicks” in accounting such as reclassifying some spending to be exempt from the spending total used for the cap and shifting costs to other fiscal years. Cuomo’s budget spokesman maintains that spending is within the 2 percent cap. “While anyone can contrive selective adjustments to get to a higher number and tell a different story, we’ll stick with a fully transparent financial plan showing spending growth within two percent for a ninth consecutive year,” said Peters.